After an already challenging race, the Watson brothers pulled into the BackDoor obstacle behind about seven vehicles. Stephen jumped out of the rig, pulled the winch line and got all his gear ready. But instead of sitting back and waiting for the other competitors to clear the way, he climbed up to see what assistance he could give. “I helped at Backdoor, which was a visible area no doubt, but both Brandon and I helped at Aftershock and Outer Limits too,” said Stephen. “Brandon was out of the car the entire time we were in Outer Limits helping to get it unclogged.” Stephen also helped a dozen or so cars down a pretty non-obvious line around their broken rig in Aftershock which got competitors through smoothly and kept Brandon safe while working on the rig. Offroad Design #4488 finished 28th with an elapsed time of 10:41:35. The team pushed really hard in the beginning just to be a part of the hour and half parking lot in Outer Limits, then end up in Aftershock with a broken rod end on a front link arm which also took out the front driveshaft. After being down in Aftershock for an hour repairing the rod end, they limped into main pit in 2WD where their pit crew had pulled a yoke and driveshaft end off one of their personal blazers and had a swaybar link ready to install. The quick pit put the brother team back out on the course in less than 20 minutes! They headed out to BackDoor where they helped fellow competitors as mentioned above, and proceeded to have a pretty clean second lap with only one driver inspired flat on their Goodyear tires. “We were coming down a sand hill and of course there is only one rock out here and I hit it!” They stopped and got another tire from a competitor who had finished his race at RM4. At the remote pit they added the Baja Designs HID light bar to the rig and focused on the finish. “At one point another competitor with smaller lights let us pass, and then tailed us, I think to use our lights. We went back to our pre-run notes and focused on executing each trail until we saw taillights in the final desert section and decided that we needed to gain that one extra spot,” chuckled Watson. 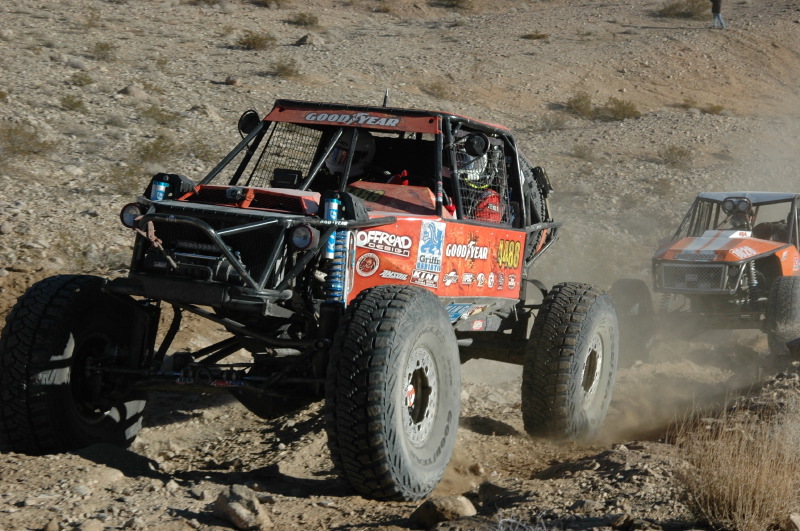 They kicked up the pace and earned the 28th finishing spot in the 2011 Griffin King of the Hammers. 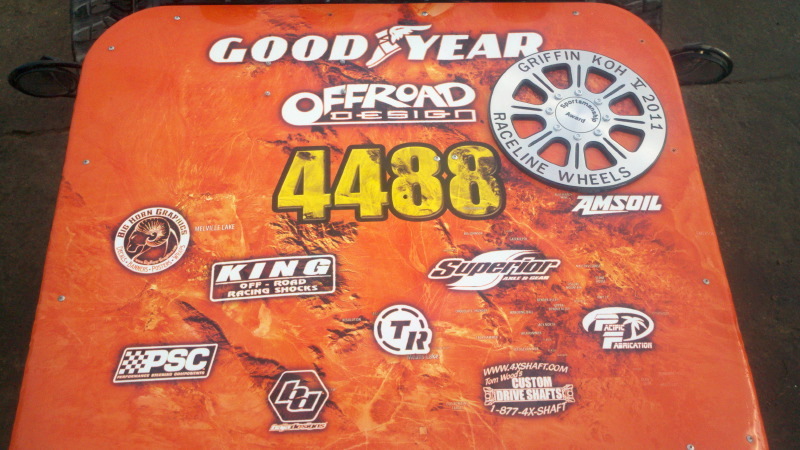 The Offroad Design team will be competing in the Grand Slam series this year to gain an entry spot into the 2012 King of the Hammers. They will attend the Best in the Desert Silver State 300, American Rock Sports Challenge and the Grand Prix at Glen Helen. About Offroad Design Racing: The Offroad Design racing team is a family affair with brothers Stephen and Brandon Watson in the cockpit and father James Watson as their crew chief. They have successfully finished three King of the Hammers races with strong 13th, 17th and 28th finishes and finished 2nd in the 2009 1000mile BITD Vegas to Reno 3 day race. The Offroad Design Ultra4 rig is built with the exact same race proven parts that they use to build customer vehicles. Stephen is president of Offroad Design which manufactures and sells offroad equipment largely for fullsize trucks, James is co-owner at ORD and handles the manufacturing shop and Brandon is a project manager for a large commercial and high end residential contractor in the Aspen area.